A lot of you seemed to love this cardigan in my previous outfit post and over in the Instagram comments. I loove it too! I have been wearing it so often and it's such a great layering piece for these days when we're transitioning into warmer weather. I love wearing this cardi with regular jeans for a casual look, but today I decided to go for an all-white combo just to mix it up. So I've got my white jeans and white trainers on - a very casual mom look. I just need to throw on my tan backpack and I'm good to go! 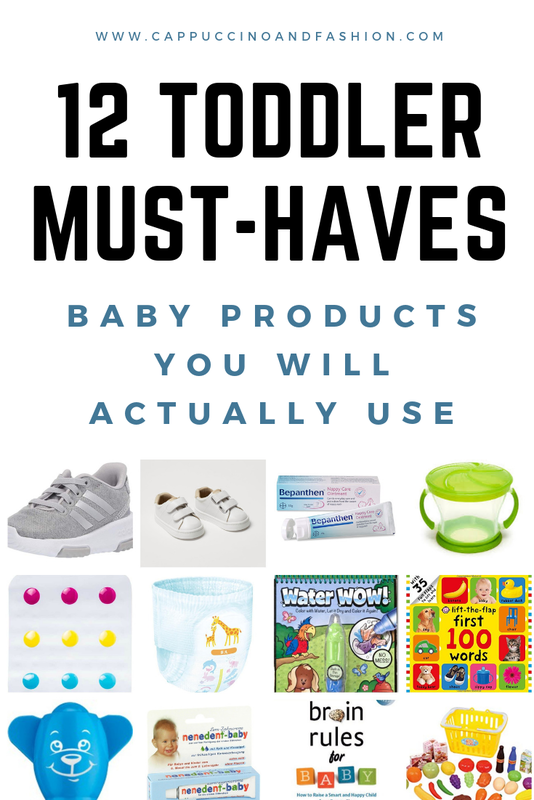 There are so many products for babies and toddlers on the market at the moment that it's hard to know which ones are worth spending your money on. I want to share with you today my favourite ones so far that I've used a lot and that my toddler also loves. These are magical and awesome! Why? Because they are mess free - woohoo! That's probably one of the loveliest phrases to hear when you're a mom, haha! These come with a pen that you fill with water and your little one can easily paint with it. It doesn't spill and once the paper dries up, it can be used again. You can basically use this colouring book forever. The pictures on these are really lovely. We have the Farm Animals one, the Safari one and a small pack of flashcards for on-the-go. Toddlers respond really well to flashcards because they are a quick and snappy activity that catches their interest, so they are more likely to learn from it. We have a set with animals and another one with objects around the house (both with realistic pictures). The way you use them is you pull 4-5 flashcards and say each object/animal on it while showing it to your toddler. Then you can lay the cards down and ask your toddler questions to encourage them to interact and respond. You can ask them to point a certain object, for example. They will learn so fast from these! You can also use First Words Books for this. My toddler loves this one. The Brain Rules for Baby book is all about how a baby's brain works, what you can do to help them achieve their maximum potential, the 4 types of parenting and which one is the best one, how to help toddlers to start talking more. It also talks about how empathy and validating a child's feelings will help in tantrum situations and will give your child a boost in self esteem and confidence in the future. It's an all around amazing book and I've gotten a lot of great tips from it, so I'm recommending it to any parent out there. Fact: Toddlers are wild! Changing their diaper can be challenging most times, so these make life so much easier. If you haven't transitioned to pull up diaper pants, I would highly recommend it because they are so much quicker to change when you've got a mobile toddler you're running around after. Sticking with the "toddlers are wild" theme, putting on shoes when you've got a toddler who's overly excited to get outside can be a bit of a task. Make your life easier by getting shoes with no laces, as these go on so much faster. We have these velcro ones, but my absolute favourite are these Adidas no-tie shoes (they're like slip-on trainers). Must have for bath time, in my opinion. We have a non-slip bath mat from Munchkin that is awesome. It sticks really well, it doesn't budge an inch and it helps avoid any bath time slipping. This one has coloured dots on it and we actually also use it as a learning activity. While he takes his bath, I will ask him to point out colours for me and it's been a really fun activity for him to practice his colours. My toddler doesn't like when his toothpaste is too minty or flavourful, since it's probably too overwhelming for him. So I picked up this Nenedent neutral-taste toothpaste from the pharmacy and he prefers it so much more. Using baby markers on paper is such a fun activity for toddlers. The reason why I like these ones in particular is because they are super-washable - they come out of clothes or surfaces quite easily and don't stain. The only thing is I have to supervise my toddler at all times with these, because sometimes he still wants to put these in his mouth. My toddler loves doing anything that I do, so pretend shopping is definitely one of his favourites at the moment. We got this toy shopping basket and he loves putting them in the basket, pouring the food bits in a pot or pan etc. It's a very fun activity for him. Keep a snack cup in your bag at all times - it will save your sanity, haha! I have a small container that I used to use for his baby food, but now I just put baby-cheerios (they're actually called Alpha Bites) in there or any type of snacks that I want to take with me. They won't spill everywhere and these will keep your toddler entertained while you finish your grocery shopping for the week, for example. This diaper rash cream is the best one we've tried. I know babies are different and not everyone reacts the same to products, but this is definitely our favourite and it clears any irritation in no-time. I don't use this toddler baby carrier as much as I used to when he was smaller, obviously. BUT sometimes it's a life-saver when your toddler gets tired at the park, but doesn't want to sit in the stroller. Having a baby carrier with you will save your arms and back, since it's so much more comfortable to wear them than to carry them in your arms. Hope you found this useful. Have an awesome day! 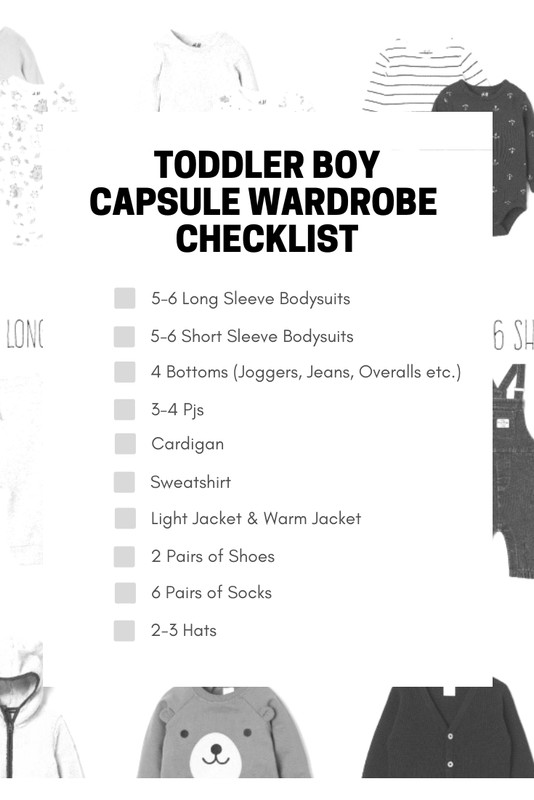 I recently had to re-do my toddler's wardrobe, so I decided to share the process with you and give you a few tips I followed in deciding what pieces we needed. If you're a toddler mom, you might get some inspiration from this hopefully. My toddler is soon turning 18 months old and this is about the time when they also change size in clothing. I could definitely tell that Victor is not really fitting well in the previous size, so I had to get a series of new clothes for him in the next size up (18-24 months or 1 1/2 - 2 years). TIP 1: Think about how many times a week you do laundry. Since we got a dryer, things have been much easier when it comes to baby laundry and I find that I can get away with having less items in his closet. If I find that I've run out of tops for some reason, I can quickly pop them in the wash and dry - and they're all clean and done in about 3-4 hours. That's been a definite game changer. If you only do the laundry once a week, for example, then you might want to get more of certain items so that you have enough until you catch up on laundry. 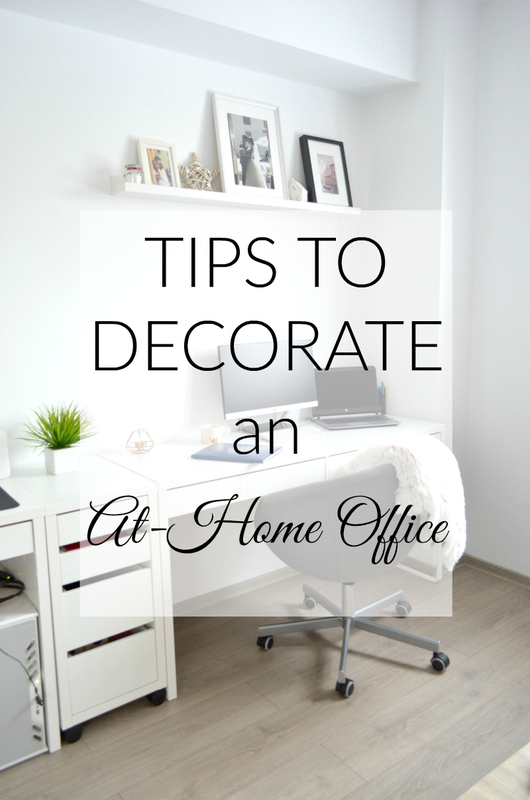 TIP 2: Choose a few basic colours. 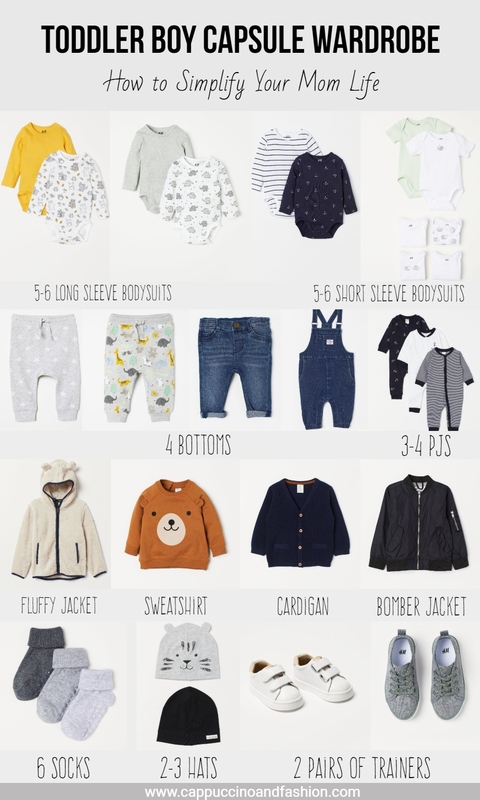 This makes life so much easier when you go shopping for your baby's new wardrobe. 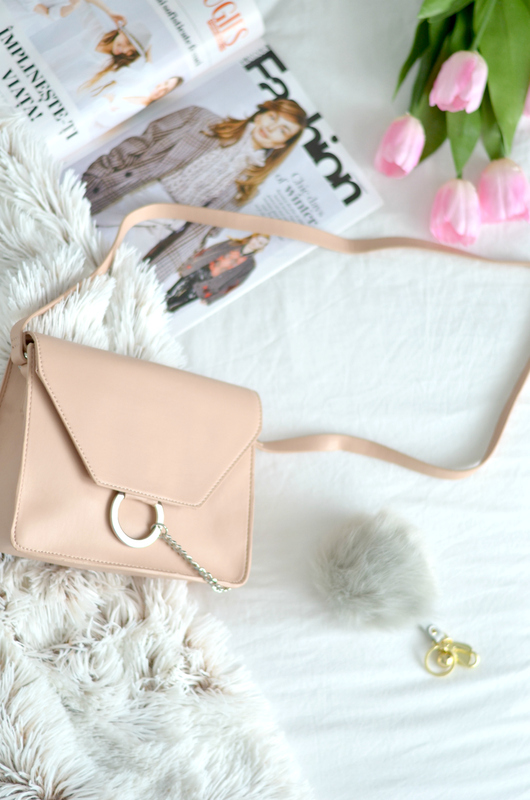 Picking a few colours that complement each other well will give you a lot of options in terms of outfits. I went for mostly neutral: grey, white, navy and a bit of mustard for some colour (as you can tell from the image above). 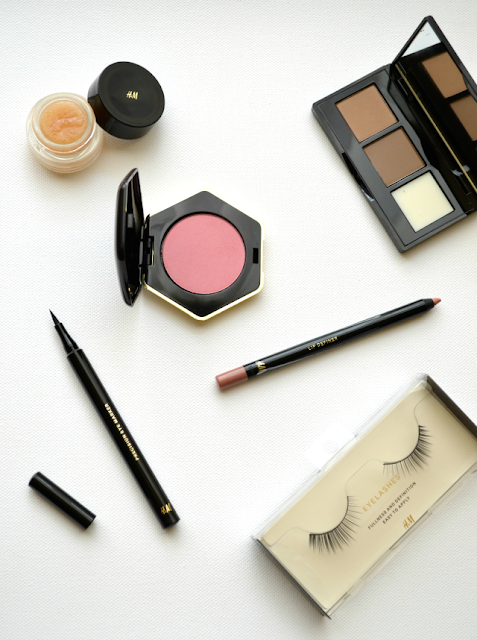 TIP 3: Try to pick things that go well with each other for the most part. If you got colours that match well, then this step will be easy. 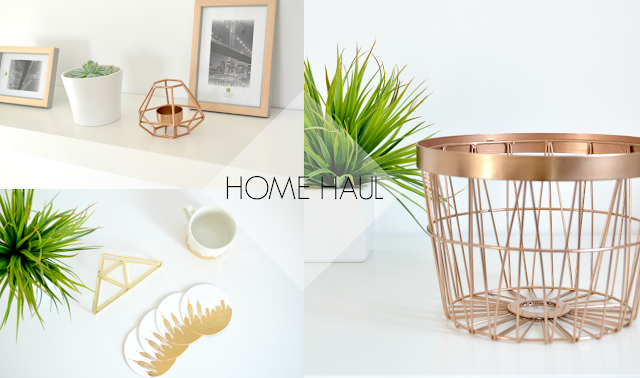 Try to find things that go with each other well and that match a lot of other items that you picked. For example, the animal print tops that I picked are quite neutral, so they would go well with pretty much any of the bottoms. That makes picking outfit sooo much easier. For tops: I chose 5-6 long sleeve bodysuits (set with mustard top, set with elephants, set with navy anchors) and 5-6 short sleeve bodysuits (the ones that I have were from C&A, but these ones from H&M are very similar as well). For bottoms: I picked up a pair of grey pants with stars, a pair of grey ones with animals, a pair of overalls (ours was from Lidl) and a pair of simple jeans (ours was a gift). The pyjamas that I picked came in a set of three and they're a cute nautical inspired set. For layers: I went for a bear sweatshirt (so cute! ), a dark grey cardigan, a light bomber jacket and a fluffy teddy jacket. I wanted to have a bit of variety since spring can come with both warm days and chillier days. The two pairs of shoes I went for are a pair of white trainers and a pair of grey Adidas trainers (these fit him like a glove and they're so perfect for running around, these are similar to the ones we picked). Finally, we needed a few new hats and some socks that I bought in sets of three and I made sure that they have grips on the bottoms so that they don't slip. This capsule wardrobe is mostly a spring one, although I know most items will last us for so long. Into the summer I will probably add some shorts, t-shirts and sandals to this. We also have some other bits in his wardrobe that we got as gifts or hand-me-downs and those are always nice to have. I find that having this core wardrobe makes things a lot easier though and any add-ons usually fit nicely within. I hope you found this useful! Have a beautiful day! We're still struggling with the recent daylight savings hour change (it was just this weekend here in Europe). 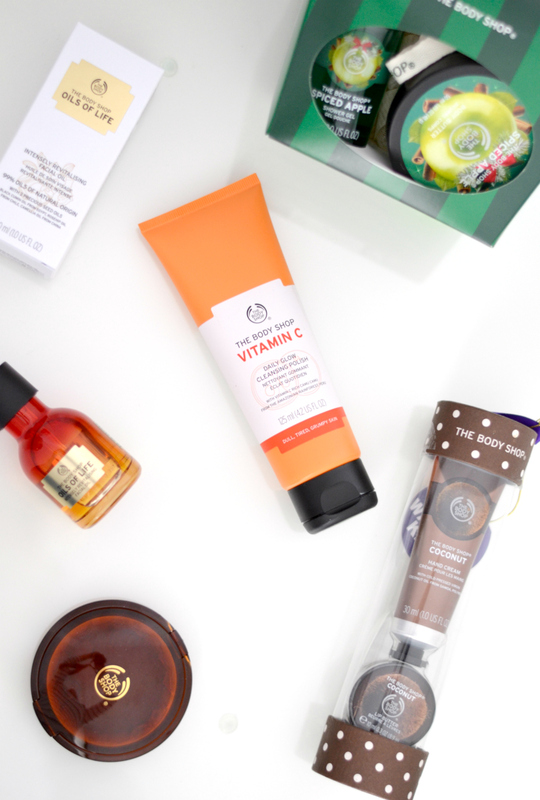 Our baby routine is totally off and it's been a bit chaotic with bedtime lately. Although we're still fighting off a cold, so that might also be a culprit. So today's outfit is a total fit because it's been my go-to one for the past few weeks. I am in love with this "love" sweatshirt (Get that super fun mom joke? :) Haha!) It is so cozy and it's perfect for mom playdates or going to playgrounds with my toddler. I paired this top with pretty much black as far as the rest of the outfit goes. Have an awesome day! Don't forget to link up your outfit below! 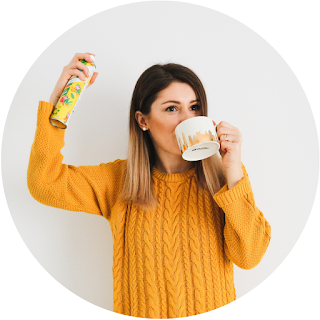 Make sure to follow this blog (Bloglovin or Instagram) and place a link back to it in your post. As moms, we're always looking for ways to entertain our children. 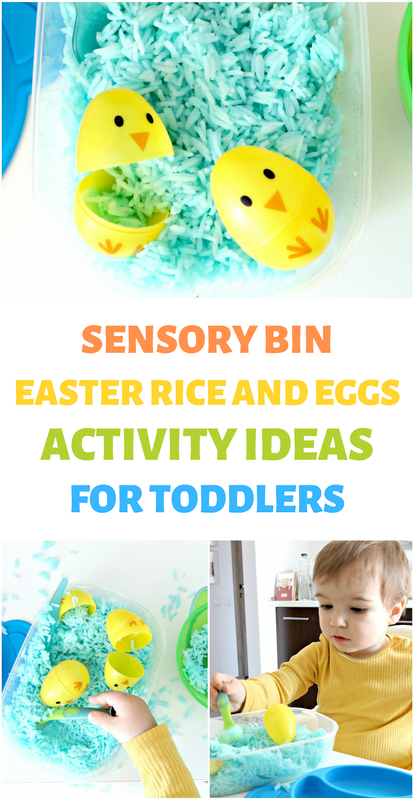 So I thought it would be fun to share a few hacks and activity ideas you can do with your toddler this Easter. I have two ways to safely colour eggs with a toddler. This first one is my favourite. You will need: whip cream, food colouring, vinegar. I hard boiled the eggs beforehand. Put whipped cream in a bowl, add some drops of food colouring and swirl it around with the end of a spoon or fork. 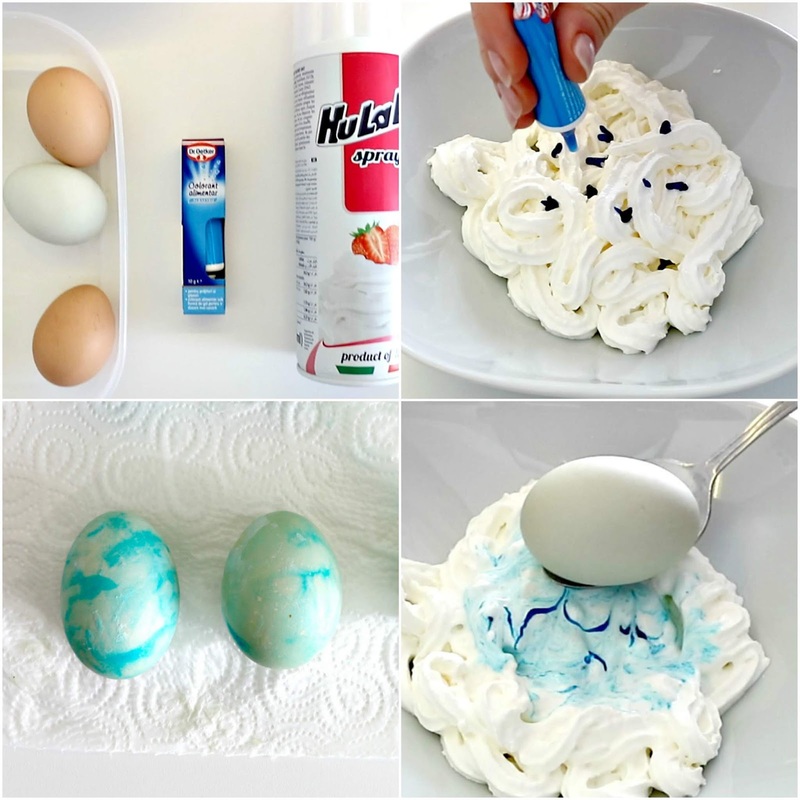 Dip the egg in vinegar, pat it dry and then add it to the whipped cream bowl. You can then take it out and leave it for a few minutes to work its magic. I then cleaned it up with just a bit of water and it turned out a really lovely pastel colour. Victor loved playing in the whipped cream and moving the egg around in there with a spoon. This is also really easy and safe for toddlers, but it was messier than the previous method. I used 1/2 cup of water, 1 tablespoon of vinegar and about 20 drops of food coloring. Mix it all together, place the egg in there with a spoon and let it sit for a while. Super easy to do and my toddler loved it, but -again - quite messy. 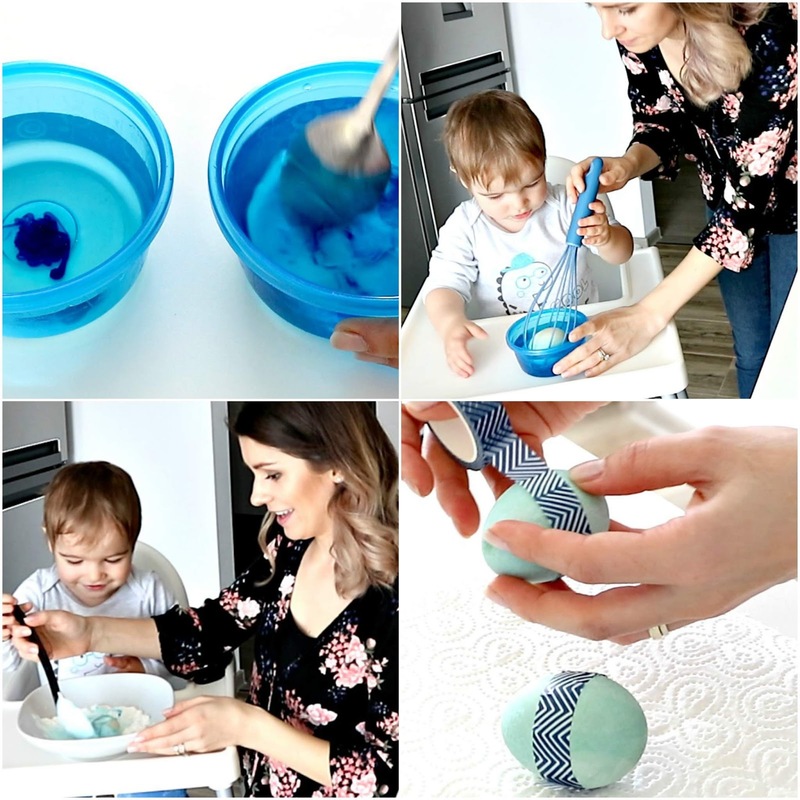 This is a hack that can make colouring eggs easier for toddlers, because it helps them handle the egg better. My toddler actually preferred working around with a spoon, but your little one might enjoy this more and it might be easier for them. 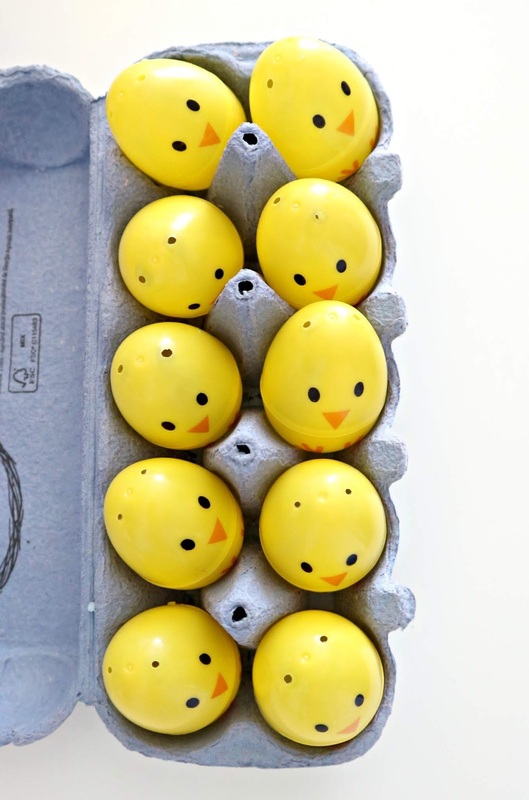 This is a super easy way to decorate the eggs you have previously coloured. I used washi tape around the egg and it was a fool-proof way to make them look cuter. I'll be honest, I initially wanted to bake cookies and decorate them. But #momlife ... so I decided to keep it simpler and, since cookies can be quite hit or miss when it comes to the recipe, I just went for my trusty muffin recipe and decorated those. My toddler could care less if it's cookies or muffins. Muffin recipe: 100 grams of butter, 150 grams of flour, 2 eggs, 3 bananas. That's it! Bake in the oven for 25-30 minutes at 180 degrees Celsius. This will make about 8 muffins. I used store bought coloured icing, but you can make your own if you prefer. This obviously has sugar in it, so it's not something I would do often with my toddler, but on a special occasion I think it's fine. I tried my hand at making a bunny on a muffin. I'm no expert, guys, but when my toddler saw it he said "bunny", so I guess it's not that bad if even he can recognize it's a bunny, haha! :) He loved decorating and squeezing the coloured tubes and, of course, licking the icing off the muffins. For this I drew a bunny shape on some contact paper (or any type of adhesive paper). Place some double sided tape bits on the side of the paper that's not sticky. Stick that part with the double sided tape on a window at your toddler's level. Then you can peel off the adhesive paper and you have one sticky bunny surface. I also drew some eyes and nose to make it cuter. Get some cotton pads or cotton balls and encourage your toddler to stick those on the bunny (if your kid is younger like mine, make sure you supervise them, so that they don't end up with cotton pads in their mouth). Victor had more fun ripping off the pads from the bunny than actually sticking them on - but, hey, whatever entertains him! This sounds a bit silly, but it was quite fun for my toddler and it helped him practice some fine motor skills. Get some baby socks, play eggs and a bin/basket/bowl. I put each egg into a sock and then handed my toddler the basket full of those. I showed him how to take out an egg myself and then he kept trying on his own. Once he figured it out he was so proud of himself and he really enjoyed this. This one was my toddler's favourite (although also the messiest of them all). I made a sensory bin with rice. I cooked some basmati rice and added a few drops of food colouring to make it blue. Then I added the rice to a tupperware container, got a couple of bowls on the side, some spoons and some plastic eggs and I let my toddler go to town with this. He was absolutely obsessed with this activity. He played with this for more than 30 minutes (that's a lot for a 17 month old). He loved practicing his fine motor skills, taking rice from one bowl to the other with a spoon. He used the egg halves to scoop rice. It was awesome and he really had fun with it! I also used the eggs I mentioned above for making little surprise eggs. I put a little snack inside each of them (a cheese puff, a little oatmeal bite, anything really) and he was so excited to open each one and enjoy his snack. I didn't use real eggs for this (for obvious reasons), instead I also used those plastic eggs. He loved placing all the eggs inside the carton and then he loved even more taking all of them out. 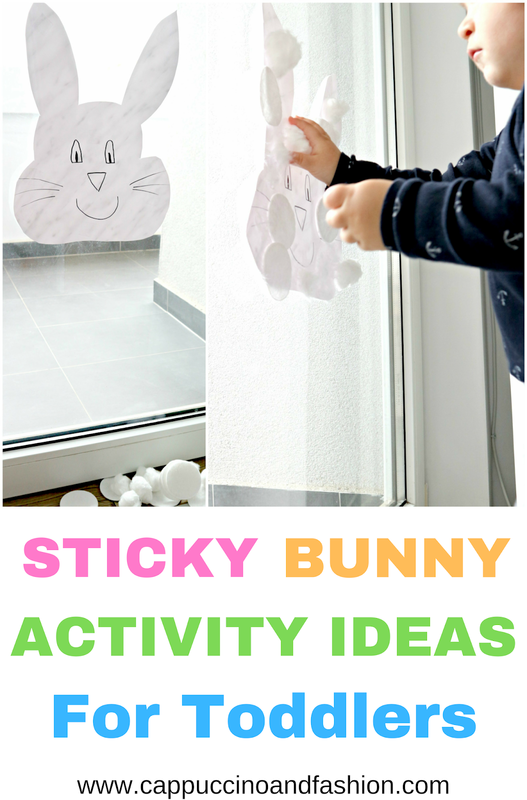 It's a super simple activity, but quite a fun one for kids. Those are all of my hacks and activity ideas for toddlers for Easter. I really hope you find these useful. If you try any of these, let me know how your toddler or kid liked them.